Kate Baldwin and Lewis Cleale. Like marriage, I Do! I Do! Has been around forever. Well, not really. The show, with music by Harvey Schmidt and book and lyrics by Tom Jones (the team that brought us The Fantasticks) actually premiered on Broadway in 1951, but its message hasn’t changed: marriage isn’t easy, but love can make it work. Rounding out a season of marriage-themed shows at the Westport Country Playhouse, as pointed out in Artistic Director Mark Lamos’ program notes (She Loves Me, Dinner with Friends and Happy Days were the others), I Do! I Do! Stars Kate Baldwin and Lewis Cleale as Agnes and Michael from the time of their wedding to their journey to their retirement home. That the marriage is happy could be debatable. What it is, is enduring. Told mostly through 19 tunes, the story of their marriage includes everything a typical couple might encounter after saying “I do,” including wedding night jitters, waiting for the birth of their first child, an affair, marrying off the kids, the possibility of divorce and the companionship of making it through all those things together. 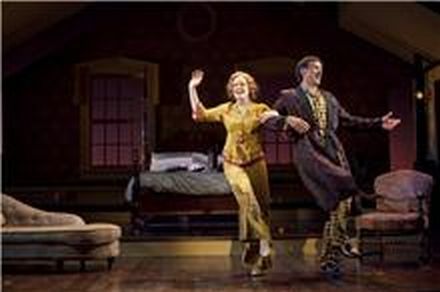 Directed by Susan H. Schulman, Baldwin and Cheale make nice transitions into older versions of their characters while lending melodic vocals to songs that don’t have the standout quality of a “It Was You” or “Try to Remember” from The Fantasticks The tunes end up sounding like a montage of the same pleasing, but undistinguished tune. The Baldwin/Cleale duet for “My Cup Runneth Over” is satisfying, however. The characters don't develop much either. Michael never really seems like the type who would have an affair and Agnes doesn’t seem to care when he does. Later, when Agnes seems to want to spread her wings beyond the marriage, we're surprised because we hadn't had any indication previously that she felt stifled. The couple just keeps singing and moving on to the next phase and song. The fault lies with the weak book and dated quality of the material (the time frame is 1898 to 1948) rather than with the skills of the actors or director. Musical Director Joel Fram and Alexander Boronson on pianos provide the accompaniment and choreographer Michael Lichtefeld provides minimal dancing crammed on a small part of Wilson Chin’s sleek, clapboard-framed set depicting the couple’s home centered around the bed. One of the highlights occurs in the audience as elderly couples exchange knowing glances or sputter with laughter during the action on stage. The show has been extended through Sept. 4 at the Playhouse, 25 Powers Court, Westport. Tickets and other information are available at http://www.westportplayhouse.org/.